When you pick a web template for your project there is one question that sort of jumps to the forefront of your mind immediately, namely it is a website efficiency. Of course, it is easy to choose the platform for your website, since here everything depends on the kind of project you run. However, when it comes to a web design, blind pursuit of trends could cause loose of clients and undermine of all gains you could get from the online being. Undoubtedly, flat design has been a huge trend for a few years now and the number of its fans is growing by the day. Let’s find out the definition of “Flat” in terms of web design. 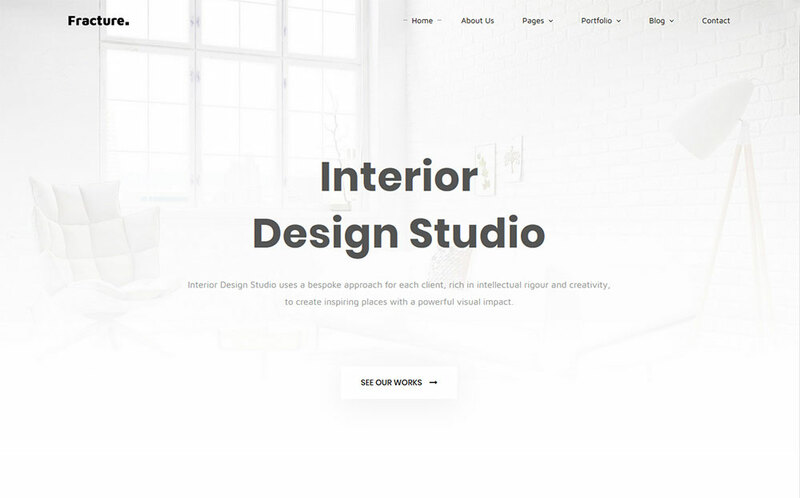 Flat design templates have a minimalistic layout styled with clean and simple details. It also has no three-dimensional elements. Usually, the creation of a flat design requires less efforts than a building of a 3D environment. It might seem quite boring for you since you can find a buck of animation tricks that would make your website look impressively voluminous. 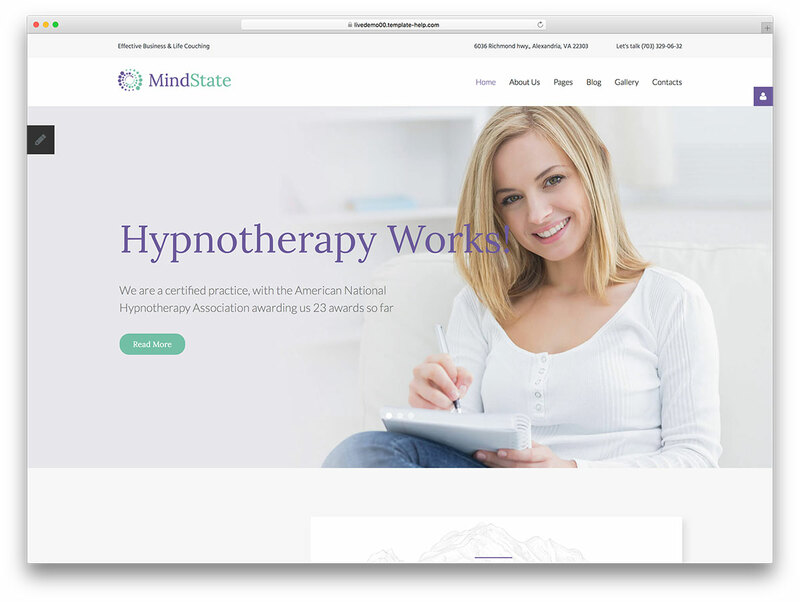 Withal, lots of people believe in a less is more statements, so for you as for a website owner, it is a high-priority task to not scare new visitors off with an overweight design. Giving preference to a flat design template you get lots of benefits. First of all, such themes are simple, without any tangled graphics and distracting elements. 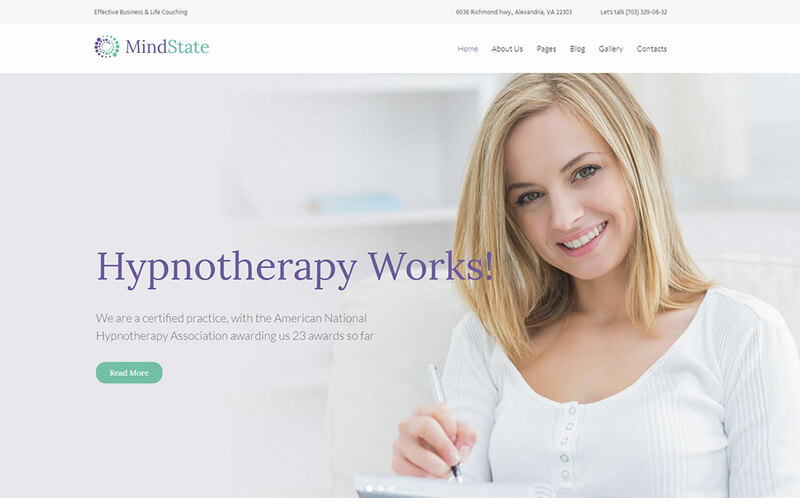 Most often, you will meet a design, that has various elements placed on a clean and white background. Use this template to establish special atmosphere, that will feet to the main message of your brand. Play with a color palette and find the best combination that will attract new customers. Such template is much easier to work with. Buying flat design template you can be sure all the attention is geared to the content you share. Since this type of design lacks engaging elements, you need to focus on your content. Basically, content is a key component of any website. 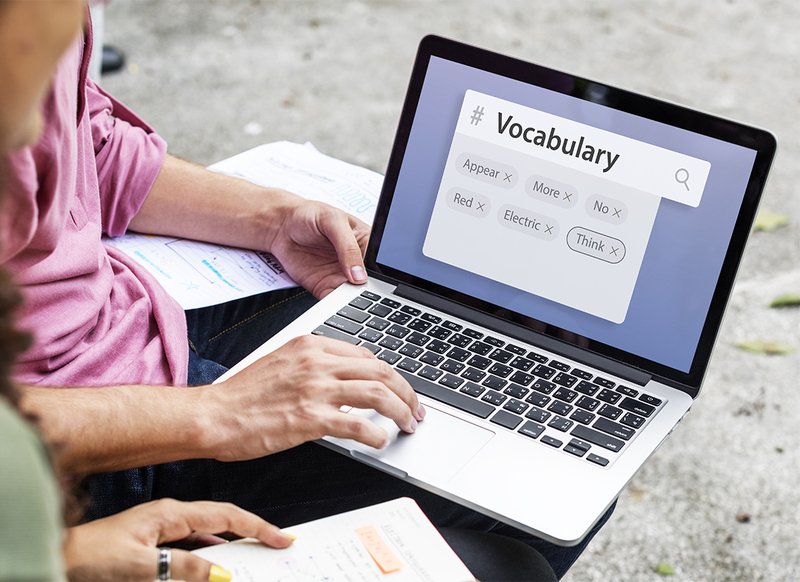 A well-written content that corresponds with search engine requirements is a powerful tool that will form credible relations with your audience. Plus, it is an indisputable way to the top of search engine. 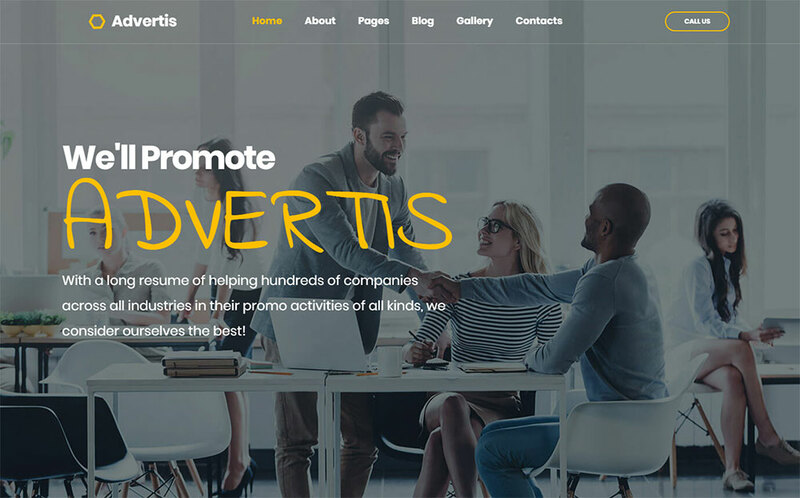 In the today’s list, you can find the best WordPress themes and other CMS and blog templates that go based on a flat design concept. So let’s dig into it and find out which one fits best for your online project. 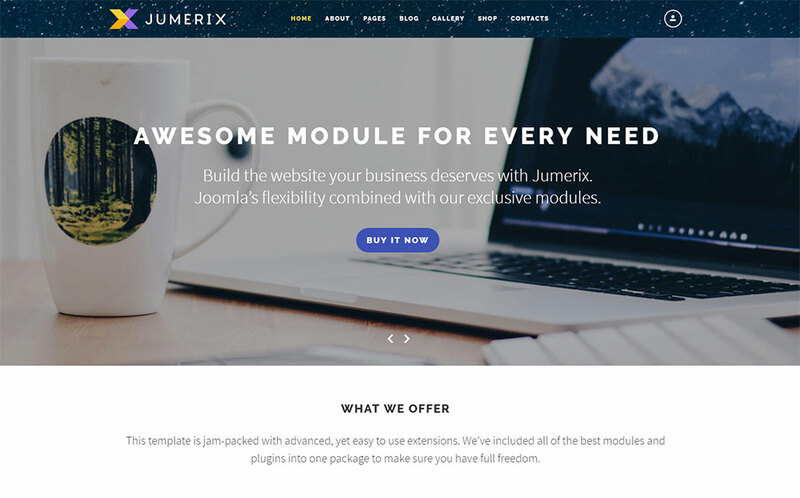 Jumerix is a star-tool to build an impressive website for your project. 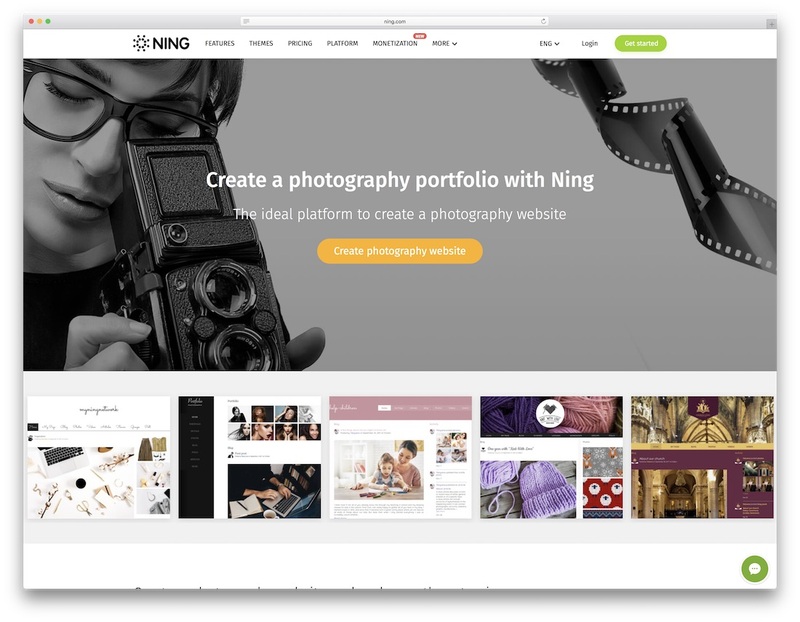 This theme will cover needs of photographers, bloggers, businessmen, and many other niche representatives. You can easily adjust the template look on your liking. Color Schemes Switcher will help you to adapt the website color in accordance with your corporate needs. Choose one from a variety of blog layouts to launch an SEO-friendly blog. Or, take an advantage of the Virtuemart E-commerce Integration to build an effective online store of any complexity. Do you need a stylish Bitcoin sell and buy the template? We have a fully-fledged Bitone theme for you, made by top industry leaders to satisfy all your needs. Let your visitors enjoy the depth of the Parallax environment. With a Stick-to-top Menu option, a buyer can scroll the page and don’t need to get back to another page for a menu. A Progress Bar will help to track a progress of the purchasing process. Also, your clients will be able to use Social Login option and log-in as a customer via their Facebook or Google account, which makes them much more involved. 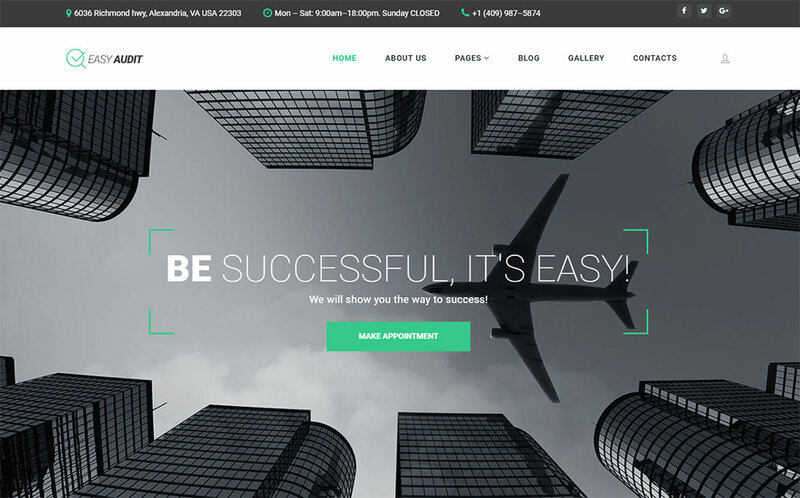 Easy Audit is a Parallax theme for a forceful online business. You will be able to add different types of content, such as pricing tables, quotes, counters and others. What is more, there are lots of additional pages like Blog, Portfolio, Forum, Gallery, History, Our Team, Career, and Pricing which you can use to make your website much more emphatic. If you have any problems while the customization process, do not hesitate to contact 24/7 support team that will help you with all your issues solving in the most friendly and professional manner. You need no coach to become an online entrepreneur. All you need is an excellent web template. 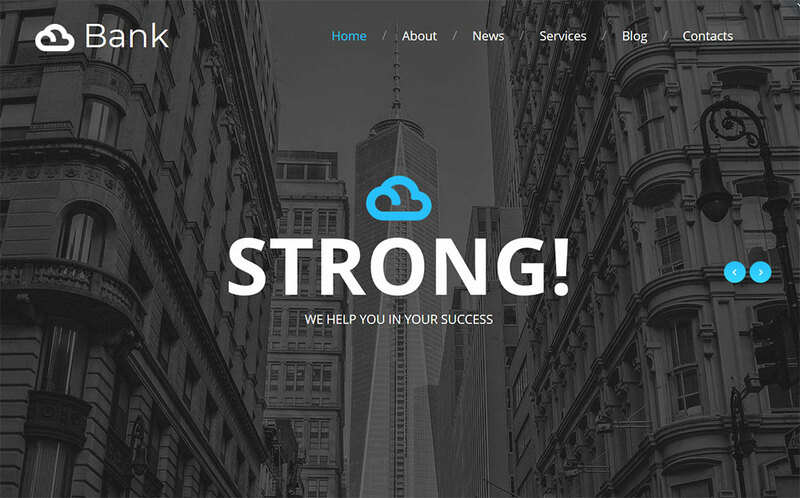 This Joomla theme has glorious flat skin and a superb toolbox. With a Slider, you can highlight the most important information for your customers. Use it to demonstrate photos from different performances, show off the new product, or promote your latest blog post. This is the best merchandise tool that will catch all the attention. Besides, you can use a Sample Content feature to fill your website with some of the properly written content. 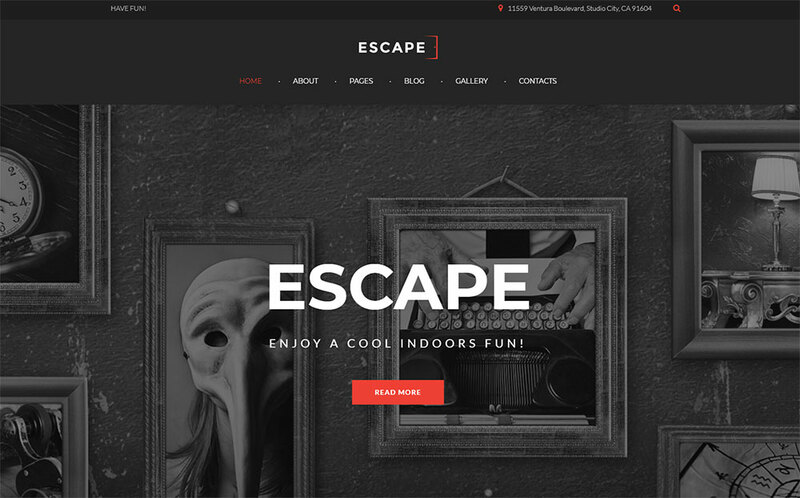 Escape the space of mediocrity with this Parallax template. Its responsive layout will catch the attention of all the mobile internet explorers. Also, your visitors will enjoy the absolute cross-browser compatibility. Let your visitors always be in touch with you via the contact form. Moreover, they will get all the promotion information on the regular basis, since the template has a Newsletter Subscription option. Go and post photos and exciting moments of the escape sessions into a sleek gallery. Is it possible to advertise advertising services? It is when you use Advertis theme. 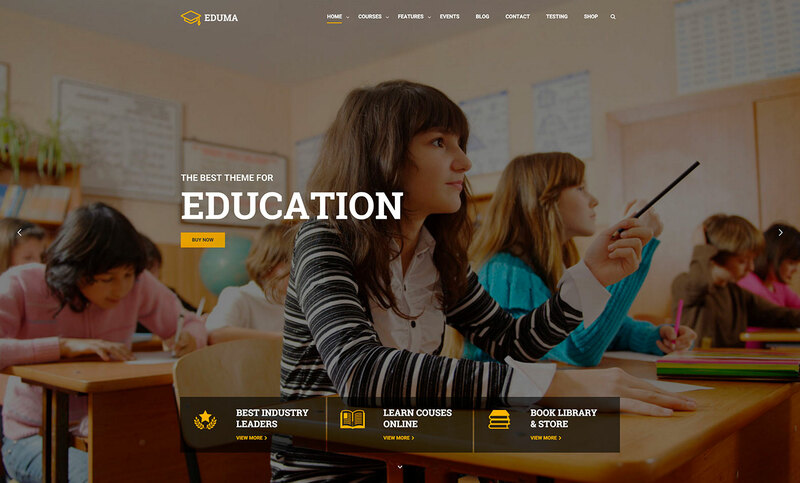 It is easy to install and operate this Joomla theme. The theme has a package of sliced PSD files included. Using those you will create a gracefully looking website. It is coded with a Semantic Code and based on Bootstrap, so you can be sure of a smooth and ongoing work of the template. There are lots of entertaining features as well. Use gallery and blog to share some informative post. Or, you can establish a forum, so your audience will use it to exchange their experience of working with you. This template is the most engaging tool to promote your advertising agency. It is easy to be stylish with the F2 template. 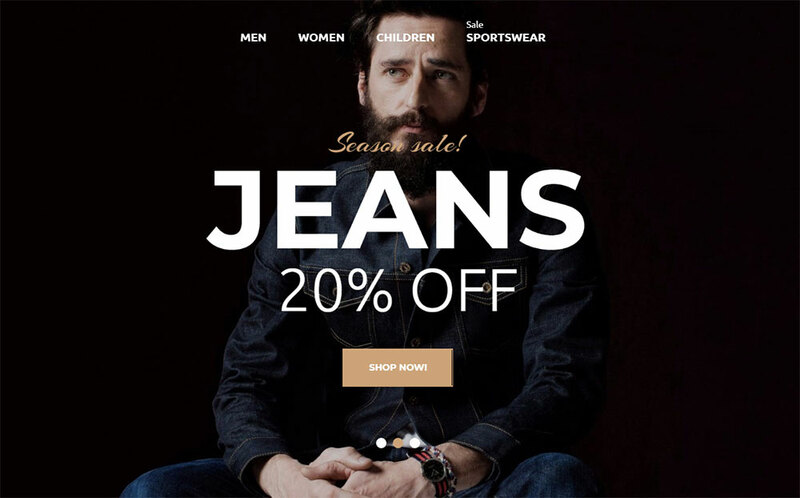 Build an e-store that will look splendidly on any device your clients prefer to use for the online shopping. 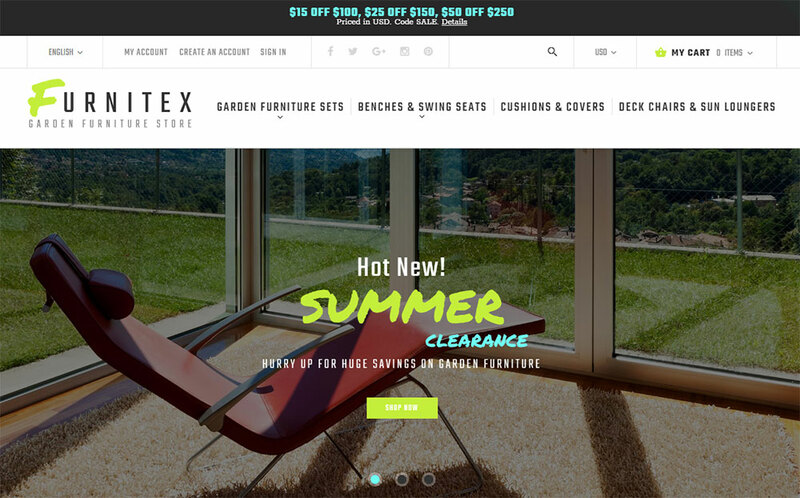 Thanks to the unique look of a Product Page and Catalog Page, your website will stay noticed. Also, you can different tricks for better product promotion. You can put Category Badges, which is quite helpful in terms of products type defining. In addition, its sorting options equipped with configurable swatches. 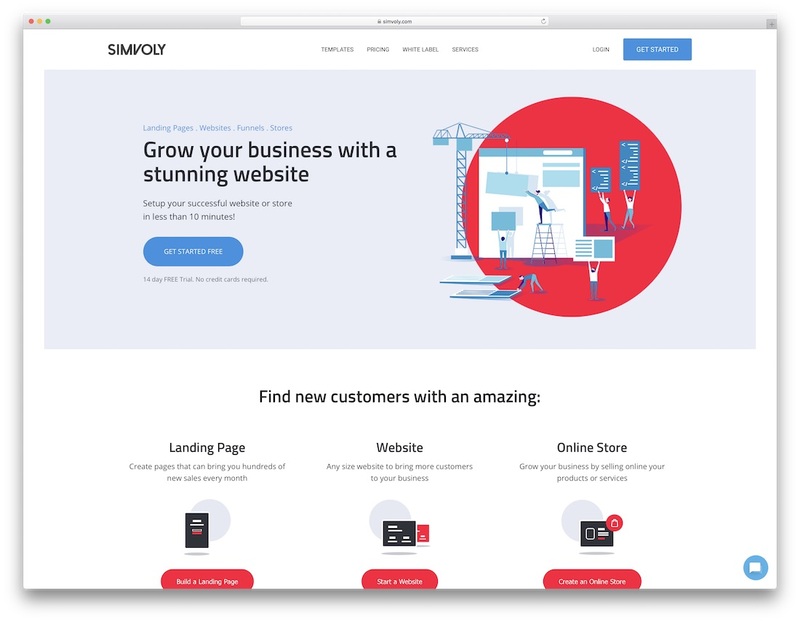 This template has lots of elements that will make your visitors completely satisfied with your shop. Magetique is a multifunction solution for your business. 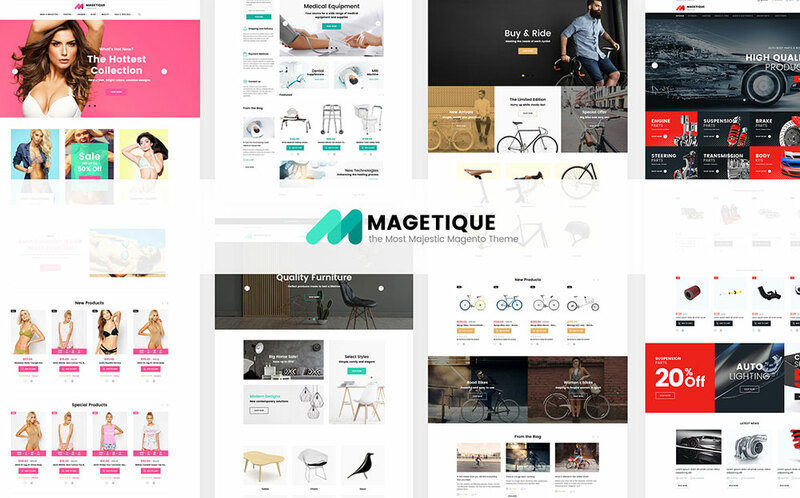 Buying this theme you get 5 topic layouts, so you can build different kinds of e-stores, such as lingerie, bikes and spare parts, cars spare parts, medical equipment, and furniture. Also, each topic has a Sample Content feature, which will save you lots of time at the beginning of the content creation. You will get 22 extensions that would cost you $1718 for FREE. Check out other beneficial features of this template and run the most efficient e-commerce project. CompShop is a Magento theme that adapts perfectly to different device sizes. Save over $1000 with TM Modules. Moreover, a neat Megamenu option gives you an opportunity to create a customized SEO-friendly menu that will please your customers from the first click. This template will be a great promotional tool, as it has such features as Newsletter Popup, Featured Products, and Product Labels. So, if combine these tricks together, you get a powerful merchandising tool and the large increases in the conversion. Bring a splash of color into your furniture store design. With this Magento theme, you can represent a small shop or a huge mart. With the Ajax functionality, your visitors can use various filters and search results while typing the request. You and your visitors will enjoy its responsiveness and compatibility provided by a well-crafted and optimized code. An Image Slider will help you to demonstrate new products to your customers. Use a Brands feature and help your customers sort and find products by their favorite manufacturer. 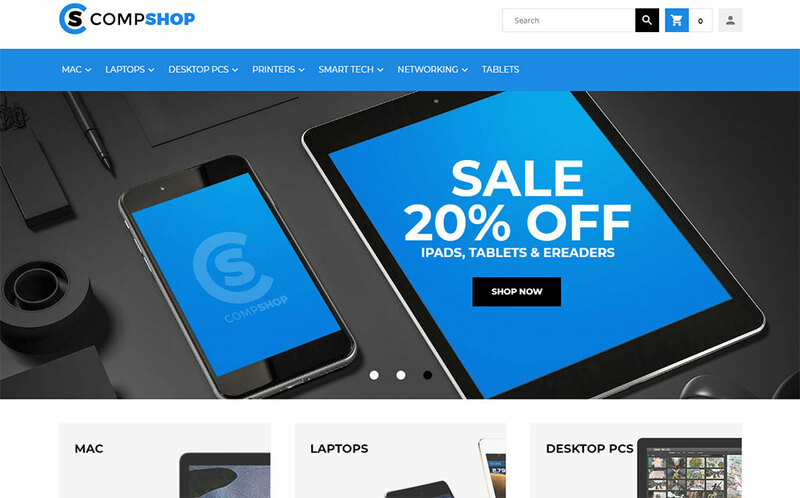 Build a fully-responsive and compatible electronic shop with the iShop template. It has unique Product Page and Catalogue, precise Megamenu, Configurable Swatches, and Carousel Product Listing. Your visitors will be able to find the most wanted products in a few clicks. The architecture of the website is super-flexible. With an intuitive admin panel, you can easily create a graceful layout for product representation. iShop template goes packed with a formidable pack of the documentation, use it once you have a question. Environment protection is a high-priority task of a today’s humanity. Being a part of this industry make sure you have a decent online representation of your company. You will get a platform equipped with a rich UI and UX kit which looks impeccable on a gorgeous flat layout. The template goes optimized for search engines besides, you can always boost its rate by launching a Blog and putting some quality content there. It is easy to install and maintain, since all the installation and set up instructions are attached. With Viva Veggie your restaurant will collect the best feedback from the visitors. This site looks accomplished on any size screen that visitors use. All images and text are also adaptive. Use various tools to provide your customers with a pleasant shopping experience. It is packed with a Custom form reservation which makes it easy to book a table without reaching the actual restaurant. 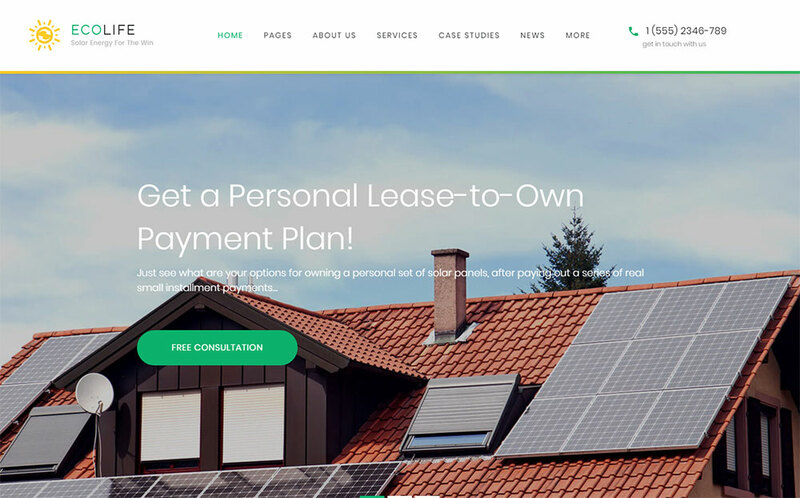 You won’t have any problems while the customization process, since this template, goes equipped with an intuitive page builder. Discover the pure beauty of the minimalism. Art theme offers 4 pre-made Homepage layouts to choose from. You can create a unique representation of your content using a pack of 700+ Google fonts and various advanced typography options. This template built in with HTML5, CSS3 & LESS, which provides smooth work and high search engine ranking. 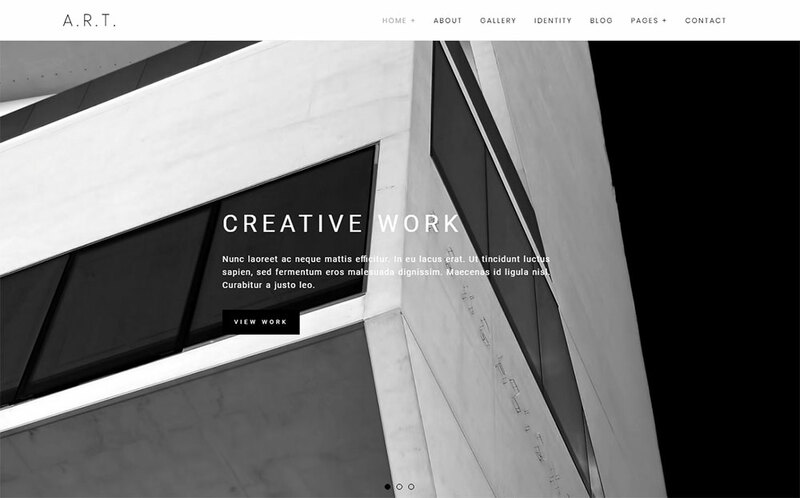 With Art WordPress theme you can create a portfolio website for the photographer work, wedding agency, or any kind of services that requires showcasing photos. Do you need a search engine friendly theme that will help your business to reach the next level? Choose Amenity and you will learn what true efficiency is. This template has an extended functionality and packed with lots of premium features. Also, the theme has a neat Page Builder integrated, so you won’t meet any difficulties while the landing page personalization. With Team Members section and a page with services, your business will look reliable to your customers and any random visitor as well. 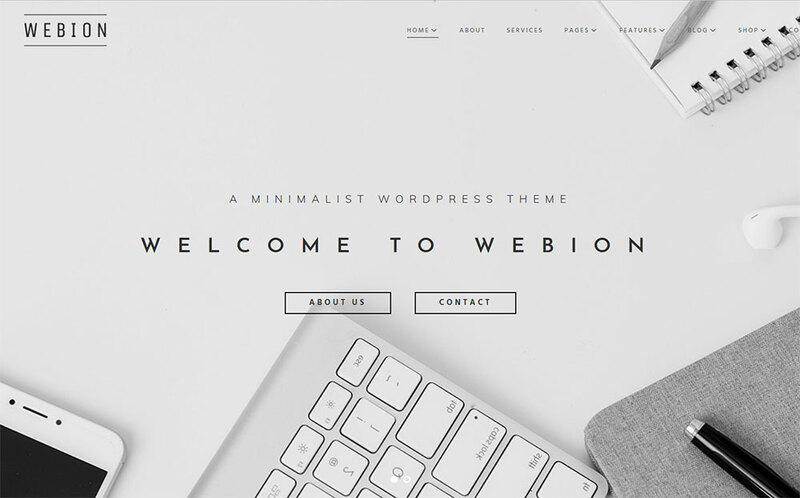 Create a website like a real pro with Webion theme. 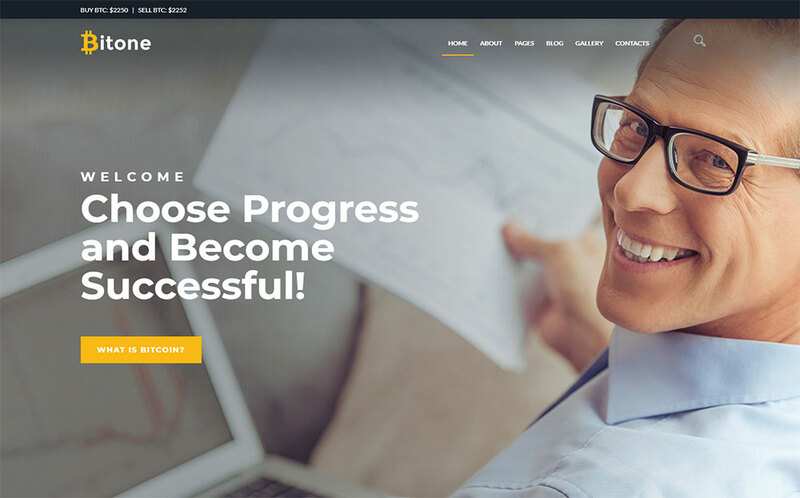 This WordPress theme goes armed with Elementor Page builder by means of which you can build a beautiful webpage less than a day. You will get an impressive pack of widgets like Google maps, Carousel, Social widgets and much more. A special JetElements addon will simplify the website creation for you. 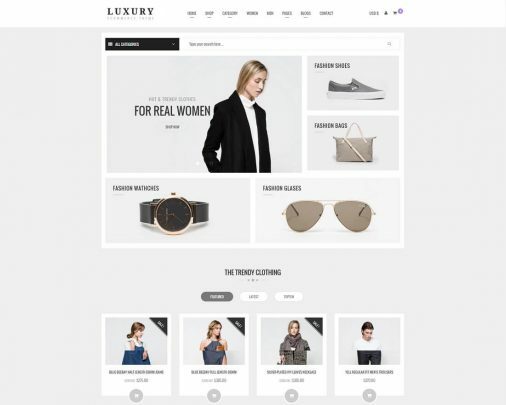 Moreover, the theme has a perfect responsiveness, so your clients will see the website menu in the best condition and definitely enjoy the shopping experience. 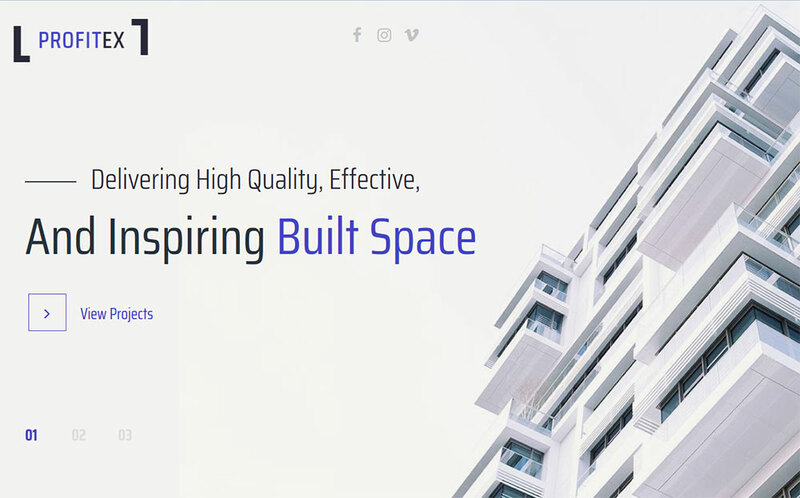 Let’s make your architecture agency noticeable on the web. Profitex was carefully built with Elementor Page builder, which allows you to add content and create a design on a drag-n-drop basis. What is more, there are lots of additional content modules provided by JetElements plugin. This template is WPML Ready, so it is a perfect solution for businessmen who are wishing to expand operations abroad. You can choose from a variety of gallery layouts and pick one that will demonstrate your work in the best light. Quadcraft is a great template for any kind of startup. 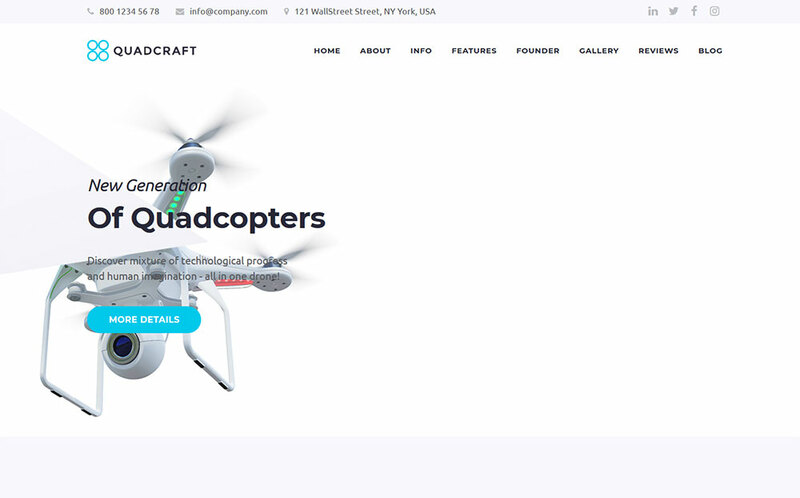 This one will be perfect for a drone-related business. Why? Because it has a pack of free high-quality images and Sample Content feature, which you can use to fill your website with a relevant content. JetElements plugin ensures rich website functionality. Moreover, you will get a Booked Appointment plugin as a bonus, so your visitors can make reservations via online system. A one-click installation option and a pack of documentation reduce the possibility of any further issues for you. 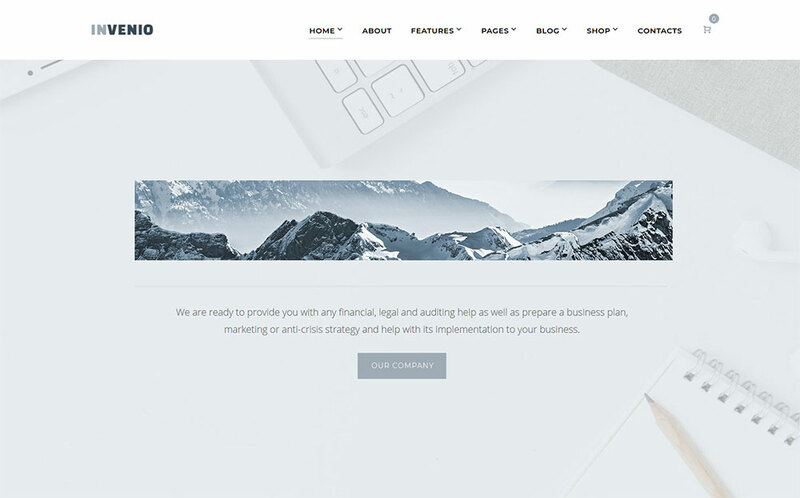 This is a top-notch minimalist template will help you to boost the efficiency of your consulting business. Use a drag-and-drop builder to put all your ideas together, Or go for ready-made Home Page, About Page, Maintenance Page, Clients Page, Pricing Page, Blog page, and save tons of time. This theme has a huge pack of Cherry functions, such as Cherry Projects, Cherry Team Members, Cherry PopUps, Cherry Services, Cherry Socialize and much more. Its clean design will not distract visitors from your products and services. Need a creative portfolio? 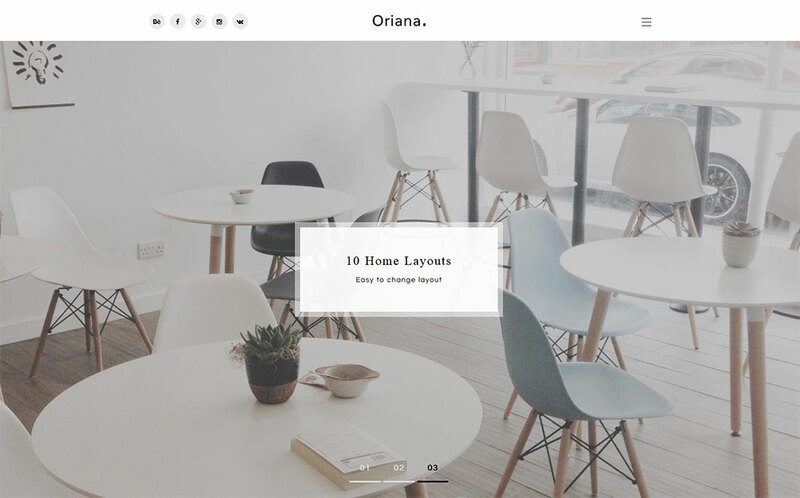 Check out Oriana WordPress theme. 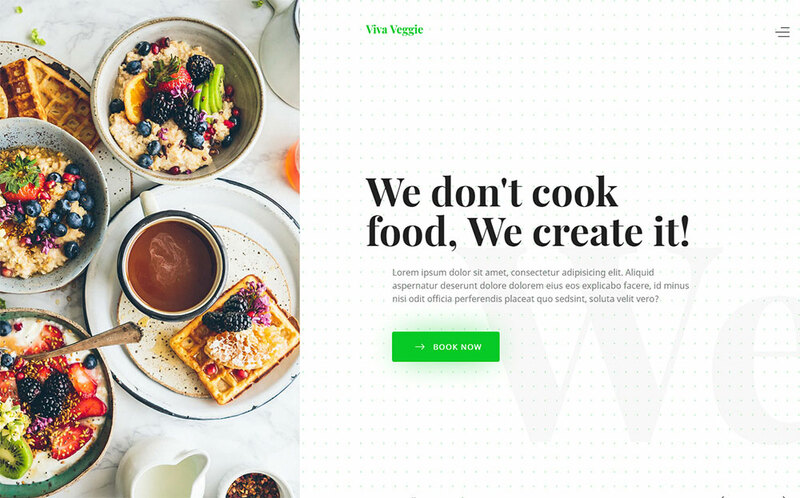 Using this template you can organize a gorgeous Grid portfolio, make color accents, and spice your content with Google Fonts. It looks quite simple yet has anything you might need. Use custom widgets to organize your banners and About area. Also, take care of the creation of an engaging environment. Your clients will always be able to reach you out via Contact Form. Likewise, Facebook Likebox is a great tool to promote social media and gain your authority. Meet Moto CMS template that requires no coding or design skills. 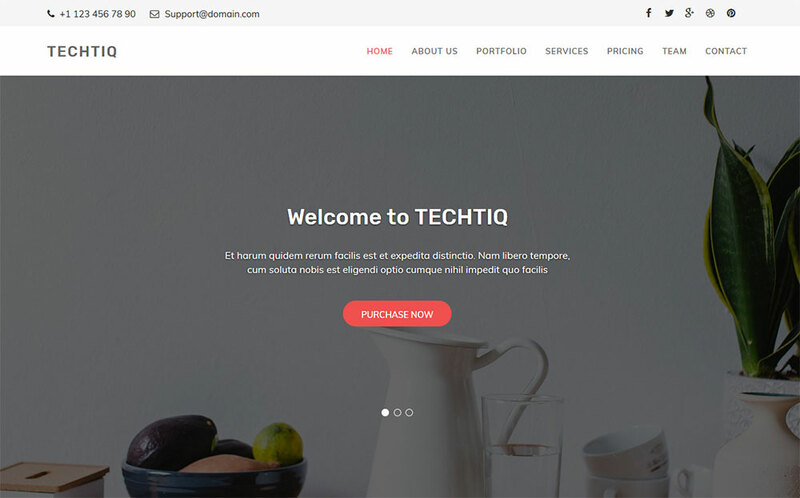 Pich this theme for your project and you will get 8 Sliders and Gallery options: Slider, Background Slider, Slider with Thumbnails, Sliding Click Action Gallery, Carousel Slider, Reflection Gallery, Grid Gallery, and Sliding Gallery. On top of it, 20 widgets and modules will greatly simplify your life. There is no need to test it in various browsers since the template is completely cross-browser compatible. It has a built-in mobile version, so you have nothing to worry about. 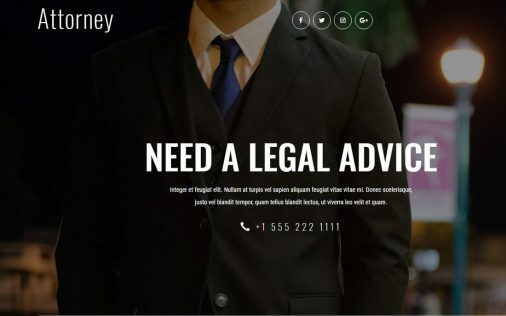 Facture template has an elegant skin that will highlight your impeccable taste. It is fully-responsive and cross-browser compatible. The template was created with HTML5 and CSS3, so the code is easy to understand for search engine and your ranking will rise rapidly. The original slider is a perfect way to represent your services and impress visitors from the first click. Every part of this theme is adjustable. 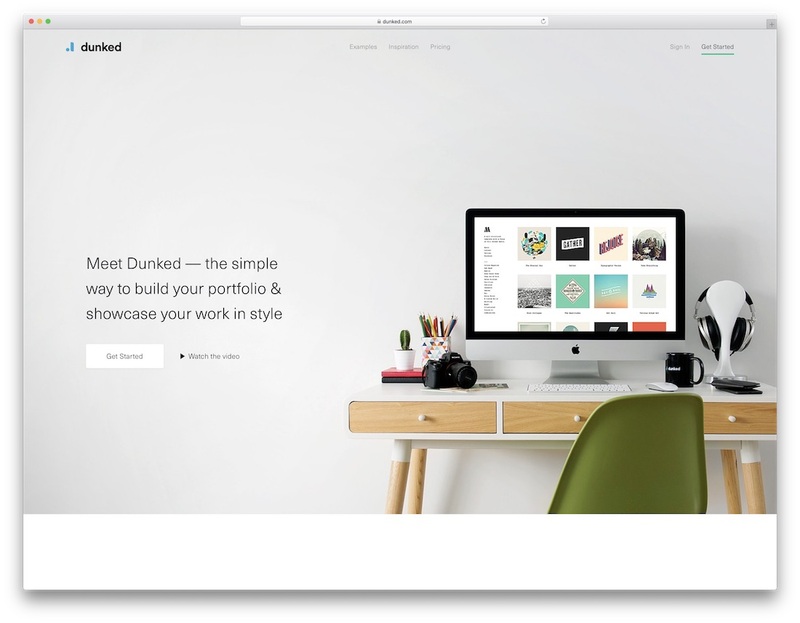 Choose from 2 gallery types and make a website that will correspond with the attitude of your company. This multipurpose template is a mix of a modern design and top web development. 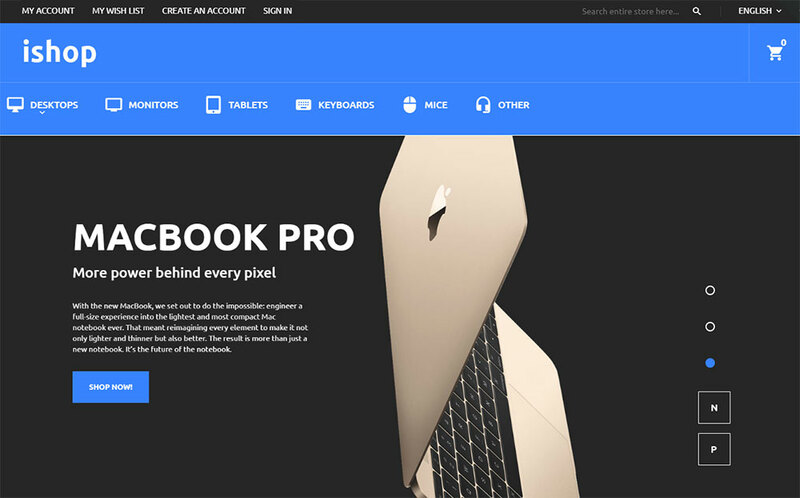 It has a responsive layout which looks accomplished on any screen resolutions. Thanks to the Parallax effect, scrolling a website will become a total joy. You can make a Youtube background video, thusly making the website even more interactive and promoting your social media accounts. This template has a carefully-organized Bootstrap filling, so this template goes easily to understand for a search engine which ensures top positions in Google.